The Syrian crisis is no longer a purely Syrian affair. Its wider dimension was highlighted on February 4, when Russia and China cast their veto at the U.N. Security Council, thereby aborting a Western-backed Arab resolution that had called on President Bashar al-Assad to step down. At a stroke, the debate was no longer simply about Syria’s internal power struggle. Instead, with their vetoes, Moscow and Beijing were saying that they too had interests in the Middle East that they were determined to protect. The region was no longer an exclusive Western preserve under the hegemony of the United States and its allies. Russia has decades-old interests in the Middle East, and in Syria in particular. As a major customer of Iranian oil, China doesn’t approve of Western sanctions against Tehran. Nor does it take kindly to U.S. attempts to contain its influence in the Asia-Pacific region. There’s a hint in the air of a revived Cold War. The Syrian crisis has, in fact, been a two-stage affair from the very beginning – internal as well as international. On the internal level, the uprising has aimed to topple the regime based on the model of Tunisia, Egypt, Libya and Yemen. In this increasingly ugly struggle, both sides – government and opposition – have made serious mistakes. The government’s mistake was to use live rounds against street protesters who were – at first at least – demonstrating peacefully. The crisis could perhaps have been defused with the implementation of immediate reforms. Instead, mounting casualties have created enormous bitterness among the population, reducing the chance of a negotiated settlement. The opposition’s mistake has been to resort to arms – to become militarised – largely in the form of the Free Syrian Army, a motley force of defectors from the armed services, as well as freelance fighters and hard-line Islamists. It has been conducting hit-and-run attacks on regime targets and regime loyalists. The exiled opposition leadership is composed of a number of disparate, often squabbling, groupings, of which the best known is the Syrian National Council. Inside the SNC, the Muslim Brotherhood is the best organised and funded element of the opposition. 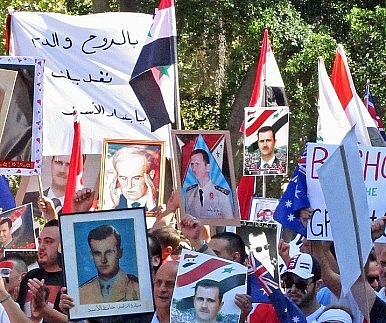 Outlawed since its terrorist campaign from 1977 to1982 to overthrow the regime of Hafez al-Assad – an attempt crushed in blood at Hama – it is driven by a thirst for revenge. No regime, whatever its political colouring, can tolerate an armed uprising without responding with full force. Indeed, the rise of an armed opposition has provided the Syrian regime with the justification it needed to seek to crush it with ever bloodier repression. Casualties over the last eleven months have been heavy – estimated at some 5,000 to 6,000 members of the opposition, both armed and unarmed, and perhaps 1,500 members of the army and security forces. There’s necessarily an element of guesswork in these figures – as in all wars the manipulation of information has been much in evidence. As a result of all this, inside Syria, the situation is today one of increased violence by both sides, of sectarian polarisation, and of a dangerous stalemate, slipping each day closer to a full-blown sectarian civil war. The second level of the contest is being played out in the international arena, where Russia and China, with some support from other emerging powers such as India and Brazil, are challenging America’s supremacy in the Middle East. Washington’s outrage at the challenge was evident when U.S. Secretary of State Hilary Clinton angrily dismissed the Russian and Chinese veto as a “travesty.” Escalating the crisis, she called for an international coalition to support the Syrian opposition against what she described as the “brutal regime” in Damascus. She has encouraged the creation of a “Friends of Syria” group, with the apparent aim of channelling funds and weapons to Assad’s enemies.